Fan is flushmounted as pictured. Aged Walnut Finish with Walnut Distressed Pine Blade finish. .. Fan includes antler light kit and 4" downrod as pictured. Can also hang flush w/ included hardw.. 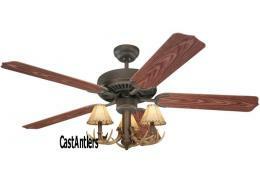 Fan includes antler light kit and 4.5" downrod as pictured. Can also hang flush w/ included har.. Fan comes as pictured with Vintage Edison Light Kit and 6" downrod. - Vintage Oil Rubbed bron.. 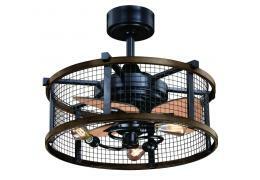 Fan comes as pictured with 4" downrod and reproduction antler light kit. Fan has Roman Bronze ..